The past was once the present, and the present will soon become the past. Every human being exists because of a particular combination of people who came before. Genetically and culturally our identities are inseparably connected to a web of people we may never have met, whose personalities and lives we craft into narratives based on vital records, inherited objects and oral histories. 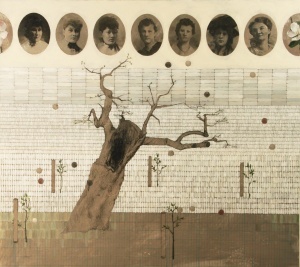 The artworks of Roots and Branches explore the influence of family history on personal identity and how personal histories shape the way we will be understood by future generations.